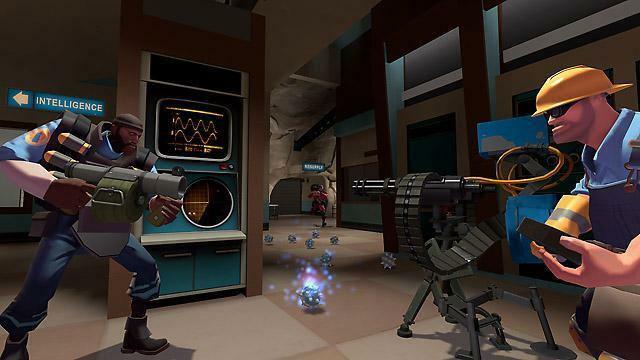 If there was such a thing as the foremost game on Steam, chances are it would be Team Fortress 2. 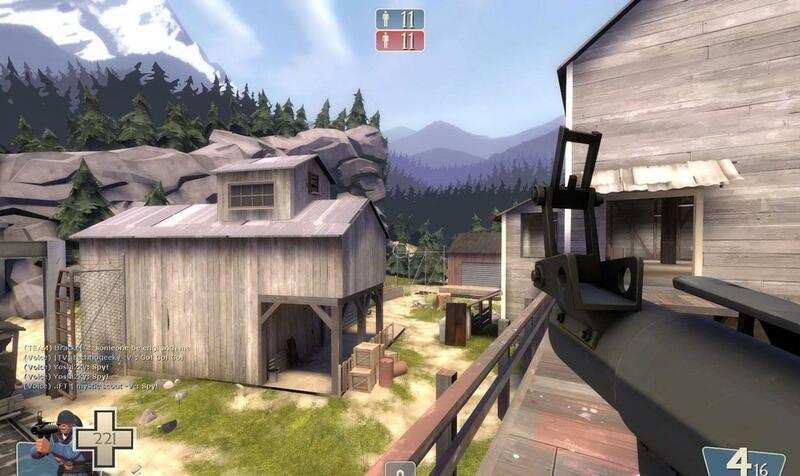 TF2 is considered to be Valve’s carrier game as it is the most widely played and modded game on the platform. The company officialised modding and the creation of modding communities via Team Fortress 2. Regardless of this, TF2 became popular based on it’s own merits as one of the most fun FPS that incorporated a certain style of humor into the game play with it’s endearing characters from the suspiciously looking Spy to the intimidating and psychotic Pyro. The game shines in almost all aspects whether you play it multiplayer or solo with bots. Bots however are predictable but the games continual humor brought about mostly by the sarcastic voice-over’s for the game characters coupled with the ridiculously funny animations would bring a smile, a snicker or outright laughter from the person playing the game. There are 9 loveable characters one can use in playing the game. Each one with specialized skills and strengths that when used in cooperation with each other within the team proves to be most beneficial in winning the match. There are 2 opposing teams, Red and Blu. These stand for 2 rival companies owned by siblings known as the Mann brothers who are trying to outdo and sabotage each other. RED abbreviates for Reliable Excavation and Demolition and BLU is Builders League United. Each one has hired a bunch of retarded mercenaries to do their dirty work. Let’s take a look at those 9 loveable characters and see what makes them literally drive the game. The Engineer is a defense character who can build and maintain devices that are necessary for the operation of the team. These include a health and ammo dispenser, an automated sentry gun turret and a teleporting device. This guy goes around with his specialized all-in-one wrench and can build, repair, upgrade and speed up the building of his devices by literally whacking it with his wrench. The Engineer also comes with a standard shotgun and pistol to defend himself. The Scout is the fastest and the most agile of all the characters. He can run very fast, double jump, and push objects much faster than the others. As an offensive character, the Scout is good at capturing control points. His weapons include a Scattergun, a pistol and an aluminum baseball bat. His main disadvantage would be his low health and that big blabbermouth of his. The Demoman is a one eyed Black dude that kind of looks like Sammy Davis Jr. with a Scottish accent. A certified drunk, this guy goes around with a bottle mumbling all sorts of nonsense and blowing things up with grenades and his sticky bomb launcher. A good defense character, the Demoman uses his explosives to set up traps for the opposing team. The Soldier is the all American military man or so it seems. Armed with a rocket launcher, a shotgun and a folding shovel, the soldier goes about his offensive maneuvers bringing the enemy down whenever and wherever he can. Overall, the Soldier is the offensive grunt of the team. The Sniper is a lanky Australian accented dude with a shady character and a more or less morose attitude. Always sporting a headpiece of sorts with a pair of shades to match, the guy will take down the opponent from a safe distance with his laser-sighted sniper rifle and a sub-machine gun for closer combat. He also carries a Gurkha Knife just in case the fighting gets too close. The Sniper is a good defense and support character to be positioned at strategic locations to prevent the enemy from achieving their goal. The psychotic Pyromaniac whose identity no one seems to know. Dressed in his fire protective suit and matching gas mask, this dude is a walking flamethrower gone berserk. His speech is inaudible as muffled by his mask and comes out as grunts, moans and chilling manic laughter. Aside from a shotgun and a fire-axe, he carries a home-made flamethrower that can set his opponents on fire as well as shoot out a strong blast of compressed air that can blow close by projectiles and his enemies away or extinguish the fire from his burning teammates. Just like the soldier the Pyro is a good offensive frontline character. The Spy is a devious support character skillful in the art of stealth. Armed with a watch device that can make him invisible, an electro-zapper which he uses to sabotage the opposing Engineer’s devices and his trusty SpyTron 3000 which enables him to disguise himself as one of the enemy, he roams around causing havoc while helping his teammates achieve their goals. The spy also carries a magnum revolver and a butterfly knife to eliminate his foes. The Heavy is the biggest member of the team. This defense character hails from the Soviet Union and talks as bad as he is big. Enhanced by the Medic with a Mega-Baboon’s heart, the Heavy is able to withstand extreme damage and although slow, packs large amounts of firepower from his mini-gun Sasha. The heavy can use his fist as well as a shotgun to defend himself. The final and most colorful character is the Medic. Unfortunately, this German Doctor is more of a mad scientist from Auschwitz than a man of medicine. 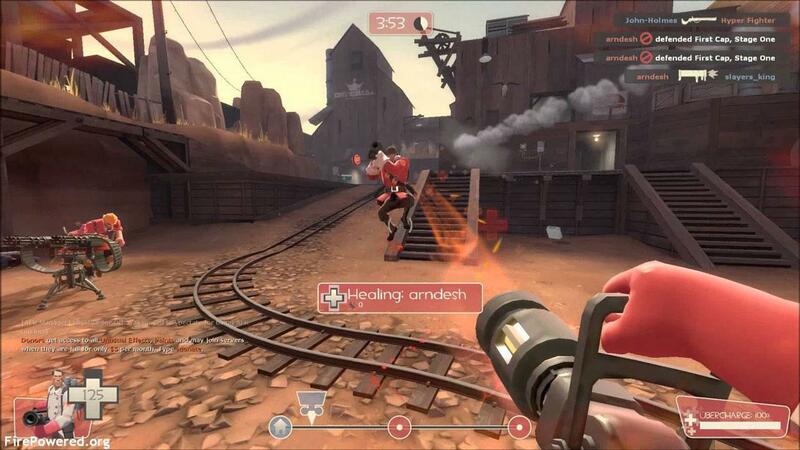 The Medic uses a Medi-Gun to heal his teammates. Prolonged exposure to the rays of the gun builds up an Uber-Charge that grants temporary invulnerability and resistance to attacks from certain weapons. The Doctor also carries with him an air-blast syringe gun and a bone-saw. He is usually seen with his favorite pet, a pigeon named Archimedes. The Game Play is very much similar to other fast paced FPS games. However, it becomes so colorful because of these 9 classes of retards chasing and hollering at each other all over the maps. The game was initially released with 6 official maps but today with continual updates making the game bigger and bigger it wouldn’t be practical to count them anymore. Maps use will depend on the game mode being played as there are specific maps designed for a particular game mode. There are several game modes available to date but most are variations of the original core game modes released with the game. These include Training Mode which is the initial entry point for noob players that use wooden targets for practice and introduces concepts of the other multiplayer modes. Capture the Flag (or briefcase) where each team must each steal the opponent’s intel-briefcase from their base and bring it back to theirs. Control Point, on the other hand, is about capturing and holding certain points or locations in the game by having a team member on the point without any opponents. King of the Hill is a variation of Control Point but there is only one at the center of the map. Both teams will have to vie for control of this. Payload has team members pushing a loaded cart from point A to B through a winding and climbing path while the enemy team tries to stop them. Arena is a team deathmatch mode where a team has to capture a single control point or eliminate all of the other team. Mann VS Machine (MVM) pits a team of mercs defending a structure against wave after wave of attacking robots. Player destruction has the teams collecting bottles of beer while eliminating the other team then jumping into a UFO tractor beam to add to their score. Pass Time mode which was added this year pits the teams against each other for control of a single ball which can be passed from team mate to team mate until it reaches the goal on the opponent’s base. The numerous maps available for play are labeled according to mode intended like cp_gorge a control point map, pl_badwater a payload map and koth_harvest a king of the hill map. Notice the adherence to Valve’s labeling system for maps just like de_dust for a bomb-defusal map in CounterStrike. Overall, the source based graphics is awesome as usual, the sound effects and crazy voice-overs are so cool, the animations hilarious and the overall gameplay immersive and fun. If you haven’t played it yet, why not give it a try? It’s free, it’s got a huge community and support and you’d be missing out on a lot of fun.